RANDOLPH, Edmund Jenings, (nephew of Peyton Randolph), a Delegate from Virginia; born in Williamsburg, Va., August 10, 1753; was graduated from the College of William and Mary, Williamsburg, Va.; studied law; was admitted to the bar and commenced practice in Williamsburg; served in the Revolutionary Army and was aide-de-camp to General Washington; attorney general of Virginia in 1776; Member of the Continental Congress in 1779, 1781, and 1782; elected Governor of Virginia in 1786 but resigned in 1788 to serve in the State house of delegates in order that he might participate in the codification of the laws of Virginia in 1788 and 1789; delegate to the Federal Convention in Philadelphia in 1787; was appointed the first Attorney General of the United States, in the Cabinet of President Washington, on September 26, 1789; transferred to the State Department as Secretary of State on January 2, 1794, and served until August 19, 1795, when he was requested to resign following charges (subsequently found to be false) preferred by Minister Fauchet of France; was the principal counsel for Aaron Burr when the latter was tried for treason; died in Clarke County, Va., September 12, 1813; interment in the Old Chapel Cemetery, Millwood, Va. -- Biographical Data courtesy of the Biographical Directory of the United States Congress. Randolph, Edmund statesman, born in Williamsburg, Virginia, 10 August, 1753; died in Clarke county, Virginia, 13 September, 1813. He was distinguished for scholarship and eloquence at William and Mary College, and at eighteen years of age was orator to commemorate the royal founders, the oration being printed by the faculty. After studying law with his father he was admitted to the bar. He was a favorite of Lord Dunmore, and when his parents left for England was only withheld from sailing with them by enthusiasm for the American cause. Washington took him into his family as aide-decamp, 15 August, 1775, and Randolph received the guests at headquarters; but on the sudden death of his uncle Peyton he returned to Williamsburg. In the Virginia convention of 1776 he assisted in framing the constitution and passing the bill of rights. He opposed the demand of Patrick Henry that the governor should have power of veto. At the close of the convention he was elected mayor of Williamsburg, and he was also the first attorney-general of Virginia's new constitution. In 1779 he was elected to congress, but soon resigned. In 1780 he was re-elected, and remained in congress two years. There he was occupied with foreign affairs. He resigned his seat in 1782, and after his father's death in 1783 succeeded to the property of his uncle Peyton, which had become encumbered with claims against his father. These he might have met by selling the Negroes, but, being conscientiously opposed to this, he had to work hard at his profession. He was one of the commissioners at the Annapolis convention which induced congress to summon the Constitutional convention of 1787. Being governor of Virginia (1786-'88), he largely influenced the choice of delegates, and it was due to his persuasion that Washington's resolution not to attend was overcome. 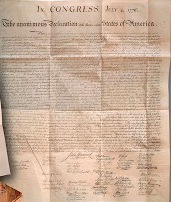 As leader of the Virginia delegation he introduced the general plan of a constitution that had been agreed on among them as a basis for opening the convention. He also drafted a detailed scheme of his own, which was discovered in 1887 among the papers of George Mason. His career in the convention was brilliant, and elicited admiration from Benjamin Franklin, who generally voted with him. He earnestly opposed the single executive, the presidential re-eligibility and pardoning power, the vice-presidential office, and senatorial equality of states. He desired an executive commission chosen by the national legislature, and resembling that of the present Swiss republic. He favored a strong Federal government which was to have power of directly negating state laws that should be decided to be unconstitutional by the supreme court. On his motion the word "slavery" was eliminated from the constitution. He refused to sign the document except on condition that a second National convention should be called after its provisions had been discussed in the country; but in the Virginia convention of 1788 he advocated its ratification on the ground that a ninth state was needed to secure the Union, and that within the Union amendments might be passed. on religious tests for office, implying power over the general subject, was supplemented by the first article added to the constitution. He resigned the governorship in 1788, and secured a seat in the assembly for the purpose of working on the committee for making a codification of the state laws. The code published at Richmond in folio, 1794, was mainly his work. While so occupied he was appointed by the president (27 September, 1789) attorney-general of the United States. 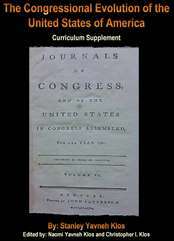 In response to a request of the house of representatives he wrote an extended report (1790) on the judiciary system. Among the many important cases arising under the first administration of the constitution was Chisholm vs. Georgia, involving the right of an alien to sue a state. To the dismay of his southern friends, Randolph proved that right to the satisfaction of the court. His speech was widely circulated as a pamphlet, and was reprinted by legislative order in Massachusetts, while the alarm of debtors to England led to the 11th amendment. Early in 1795 Randolph issued, under the name of "Germanicus," an effective pamphlet against the " Democratic societies," which were charged with fomenting the whiskey rebellion at Pittsburgh, and exciting an American Jacobinism. Randolph tried to pursue, as usual, a non-partisan course in foreign affairs with a leaning toward France, Washington doing the like. Jefferson having retired, Randolph accepted, very reluctantly, 2 January, 1794, the office of secretary of state. His advice that an envoy should go to England, but not negotiate, was overruled. He advised the president to sign the Jay treaty only on condition that the "provision order" for the search of neutral ships were revoked. The Republicans were furious that the president and Randolph should think of signing the treaty apart from the "provision order"; but Washington, after the objectionable 12th article had been eliminated, was willing to overlook its other faults, but for the order issued to search American ships and seize the provisions on them. Meanwhile France was so enraged about the treaty that Monroe could hardly remain in Paris. During Jay's secret negotiations, the French minister, Fauchet, left Philadelphia in anger. treasury, Gabriel Duval, who decided against him. Thereupon his lands, and the Negroes so conscientiously kept from sale and dispersion, were made over to Hon. Wilson Cary Nicholas, by whom the debt was paid in bonds, from which the government gained $7,000 more than the debt and interest. Meanwhile Randolph had again taken his place at the head of the Virginia bar. He was one of the counsel of Aaron Burr on his trial for treason at Richmond. He also wrote an important “ History of Virginia,” the greater part of which is now in possession of the Historical society of Virginia. Though much used by historians, it has never been published. In it there is an admirable sketch of the life and character of Washington, concerning whom no bitterness survived in his breast. 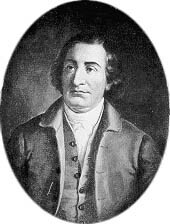 For the fullest account of Edmund Randolph, and of his ancestors, see “Omitted Chapters of History, disclosed in the Life and Papers of Edmund Randolph,” by Non-cure D. Conway (New York, 1888). Edmund Jenings Randolph (August 10, 1753 – September 12, 1813) was an American attorney, Governor of Virginia, Secretary of State, and the first United States Attorney General. Randolph was born on August 10, 1753 to the influential Randolph family in Williamsburg, Virginia. He was educated at the College of William and Mary. After graduation he began reading law with his father John Randolph and uncle, Peyton Randolph. In 1775, with the start of the American Revolution, Randolph's father remained a Loyalist and returned to Britain; Edmund Randolph remained in America where he joined the Continental Army as aide-de-camp to General George Washington. Upon the death of his uncle Peyton Randolph in October of 1775 Randolph returned to Virginia to act as executor of the estate, and while there was elected as a representative to the Virginia Convention. He would go on to serve as mayor of Williamsburg, and then as the first Attorney General of the United States under the newly-formed government. He was married on August 29, 1776 to Elizabeth Nicholas (daughter of Robert C. Nicholas), and had a total of six children, including Peyton Randolph Governor of Virginia from 1811 to 1812. Randolph died at age 60, suffering from paralysis, September 12, 1813 while visiting the home of a friend, Nathaniel Burwell of Carter Hall, near Millwood, Virginia, in Clarke County and is buried at a nearby Burwell family cemetery "Old Chapel". Randolph was selected as a delegate to the Continental Congress in 1779, and served there to 1782. During this period he also remained in private law practice, handling numerous legal issues for George Washington among others. Randolph was elected Governor of Virginia in 1786, that same year leading a delegation to the Annapolis Convention. 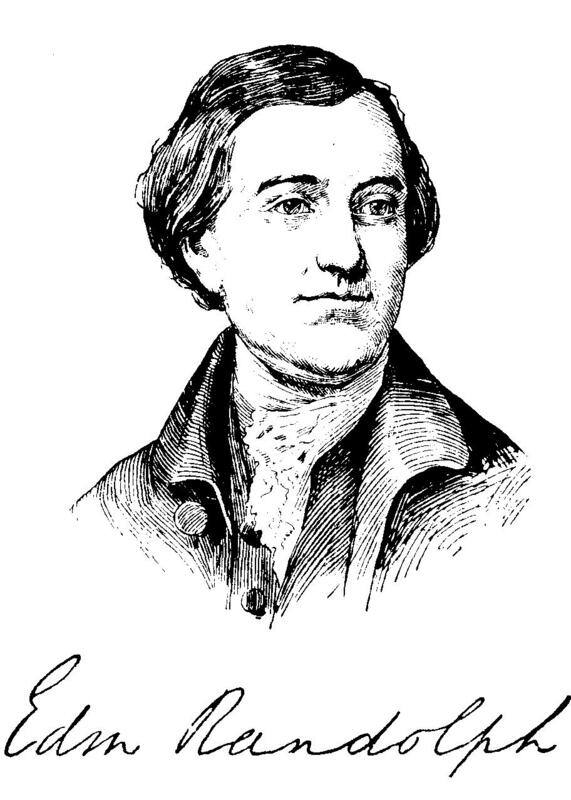 The following year, as a delegate from Virginia to the Constitutional Convention, Randolph introduced the Virginia Plan as an outline for a new national government. He argued against importation of slaves and in favor of a strong central government, advocating a plan for three chief executives from various parts of the country. The Virginia Plan also proposed two houses, where in both of them delegates were chosen based on state population. Randolph additionally proposed, and was supported by unanimous approval by the Convention's delegates, "that a Nationally Judiciary be established" (Article III of the constitution established the federal court system). The Articles of Confederation lacked a national court system for the United States. Randolph was also a member of the "committee on detail" which was tasked with converting the Virginia Plan's 15 resolutions into a first draft of the Constitution. Randolph refused to sign the final document, however, believing it had insufficient checks and balances, and published an account of his objections in October 1787. He nevertheless reversed his position at the Virginia Ratifying Convention in 1788 and voted for ratification of the Constitution because eight other states had already done so, and he did not want to see Virginia left out of the new national government. Randolph was appointed as the first U.S. Attorney General in September 1789, maintaining precarious neutrality in the feud between Thomas Jefferson (of whom Randolph was a second cousin) and Alexander Hamilton. When Jefferson resigned as Secretary of State in 1793, Randolph succeeded him to the position. The major diplomatic initiative of his term was the Jay Treaty with Britain in 1794, but it was Hamilton who devised the plan and wrote the instructions, leaving Randolph the nominal role of signing the papers. Randolph was hostile to the resulting treaty, and almost gained Washington's ear. Near the end of his term as Secretary of State, negotiations for Pinckney's Treaty were finalized. A scandal involving an intercepted French message led to Randolph's resignation in August 1795. The British Navy had intercepted correspondence from the French minister, Joseph Fauchet, to the U.S. and turned it over to Washington. Washington was dismayed that the letters reflected contempt for the United States and that Randolph was primarily responsible. The letters implied that Randolph had exposed the inner debates in the cabinet to the French and told them that the Administration was hostile to France. At the very least, Elkins and McKitrick conclude, there "was something here profoundly disreputable to the government's good faith and character." Washington immediately overruled Randolph's negative advice regarding the Jay Treaty. A few days later Washington, in the presence of the entire cabinet, handed the minister's letter to Randolph and demanded he explain it. Randolph was speechless and immediately resigned. Elkins and McKitrick (pages 425-6) conclude that Randolph was not bribed by the French but "was rather a pitiable figure, possessed of some talents and surprisingly little malice, but subject to self-absorbed silliness and lapses of good sense." After leaving the cabinet he returned to Virginia to practice law; his most famous case was that of defense counsel during Aaron Burr's trial for treason in 1807. Start your search on Edmund Randolph.